Arterial stiffness is one of the early signs of cardiovascular disease, and arterial stiffening has been observed in children. A recent study suggests that an easy-to-use, non-invasive method can produce reproducible estimates of arterial stiffness in adolescents aged 16-19 years. The results of the study, conducted at the University of Jyväskylä, were published in the journal Clinical Physiology and Functional Imaging. 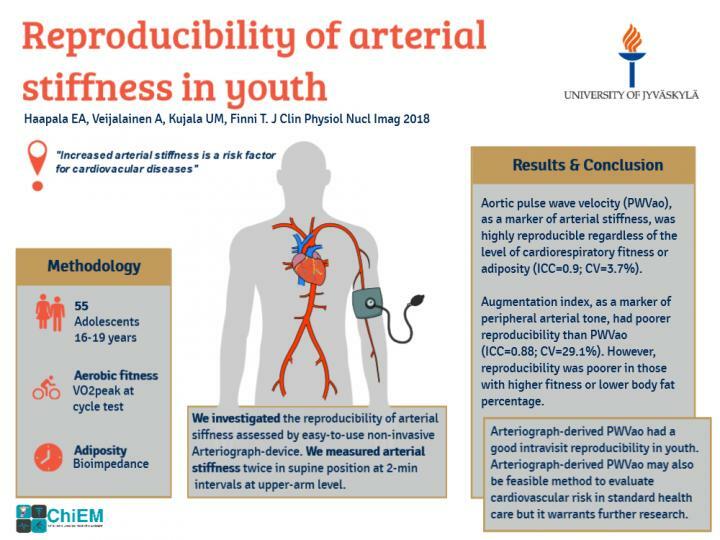 The study investigated the short-term reproducibility of aortic pulse wave velocity as a measure of arterial stiffness and of augmentation index as a measure of peripheral arterial tone among 55 Finnish adolescents aged 16-19. The study also investigated the effects of cardiorespiratory fitness and body fat percentage on the reproducibility. Arterial stiffness and peripheral arterial tone were measured with a non-invasive, oscillometric pulse wave analyzer, cardiorespiratory fitness using a maximal cardiopulmonary exercise test on a cycle ergometer, and body fat percentage through bioelectrical impedance analysis. Aortic pulse wave velocity was highly reproducible, and cardiorespiratory fitness or body fat percentage had no effect on the reproducibility of aortic pulse wave velocity. However, the augmentation index exhibited poorer reproducibility than aortic pulse wave velocity in young people. Reproducibility of the augmentation index was decreased, especially among adolescents with higher cardiorespiratory fitness or a lower body fat percentage. "The results of our study are promising, as most devices used to assess arterial stiffness require highly skilled assessors. In particular, our findings on the good reproducibility of this method used to measurearterial stiffness may provide new possibilities, not only in research settings, but also in standard health care," says Dr Eero Haapala from the University of Jyväskylä. "However, although our results are positive, more research is needed on the long-term reproducibility and ability to predict health later in life." Cardiovascular diseases, which often have their origin in childhood, are remarkable clinical, public health, and economical problems. Arterial stiffening is one of the most important risk factors for these diseases, and increased arterial stiffness has been linked to elevated risk of heart attack and reduced brain health. Brisk physical activity and high cardiorespiratory fitness have been associated with more flexible arteries already in children and adolescents.